This amazing apartment (HUTB-010458) is located within walking distance from Plaza Espanya, the Fira de Barcelona and Sants Estació. It is situated a recently opened building. It has a double bedroom with a king size bed, spacious wardrobes and a safe deposit box. 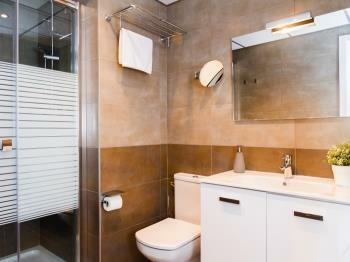 A fully equipped bathroom with shower and towels. The living room with large windows in every space, the apartment is full of natural light with a double sofa bed and the kitchen are fully equipped (satellite TV, DVD, free WIFI access, microwave, oven, washing machine...). 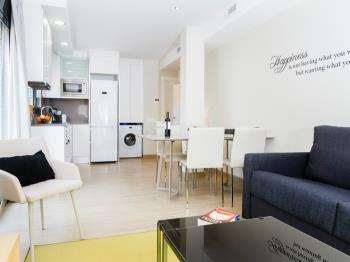 With a functional and modern decoration, you will feel at home while in Barcelona. 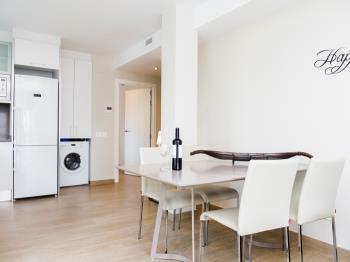 This apartment can accommodate up to 4 people. This apartment has a 50m2 terrace with table and chairs where you can relax and enjoy the sunny weather in Barcelona and the stunning views of the city. 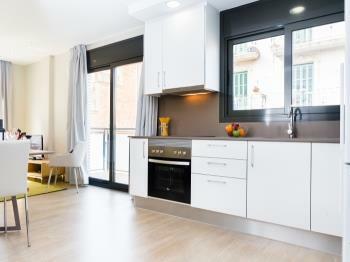 The building has parking facilities accessible with elevator at a cost of 15€ per night. Please, book your parking space in advance as this service is subject to availability. The building has a lovely roof terrace with deckchairs and chairs from which you can enjoy the views of Barcelona and the mountain of Montjuïc. This will be the perfect place to enjoy Barcelona‘s sunny weather. We have other apartments in the same building. Do not hesitate to contact us in case you need more than one apartment, we might have the apartment that suits your needs better. 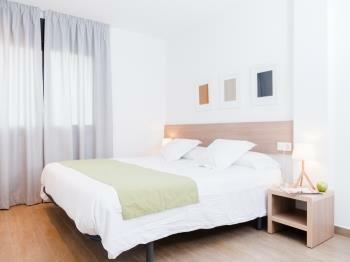 One set of linen and towels is provided at the beginning of the stay. We will offer you a basic welcome pack of basic products. You can acquire the rest that you may need in the shops available nearby. For long stays (more than 7 nights) an extra cleaning service will be done for free. Other residents are living in the building, so parties and noises at night are totally forbidden. 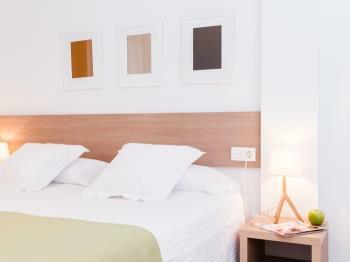 In compliance with current local regulations, the applicable taxes on stays in tourist apartments will be collected (2,48EUR / person / night). Guests under the age of 17 are exempt from paying this rate. Apartment (HUTB-010458) located in a building of recent construction. It is bright and has a private terrace. The bedroom has a double bed and storage space in the closets. In the central space the living room, kitchen and dining room are harmoniously distributed. This space gives access to the terrace and has plenty of natural light as the large windows. The terrace has a table with chairs and deck chairs where you can relax and enjoy the good weather. 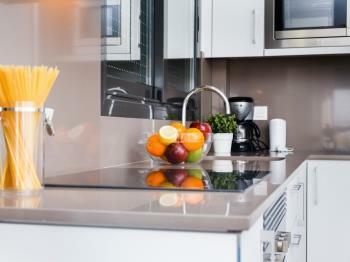 In the kitchen you will find all the utensils and home appliances you will need during your stay to prepare your meals at home. There is a dining table with chairs. The living room has a sofa that converts to a double bed. There is satellite TV and WiFi. The building has a lift, parking and a communal terrace on the roof with views equipped with sun loungers and tables. You can reserve a parking space for 15EUR / night. The building has reception, where we will help you to solve any doubts you may have during your stay. If you have an emergency outside reception hours, you can contact us by phone 24 hours a day. It is a very convenient neighborhood as it is well connected with the main access roads to the city and has many services. At 100 meters from the apartment, you will find a commercial axis and a market with local products where you can get what you will need during your stay. Nearby you can visit Las Arenas, a disused bullring transformed into a shopping center, and Montjuïc, an area where you can enjoy nature, play sports, or have views of the whole city. The nearest metro station is Hostafrancs (L1 - Roja). Also nearby you will find Plaça Espanya and Sants. In Plaça Espanya there are several metro lines (L1 - red, L3 - green) FGC (L8) to access the Firal area of Gran Via II, and several bus lines. Sants is the main train station of Barcelona (Renfe). 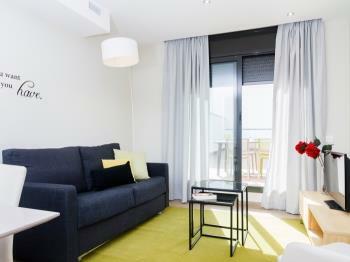 In compliance with current local regulations, the applicable taxes on stays in tourist apartments will be collected (2,48EUR / person / night). Guests under the age of 17 are exempt from paying this rate. 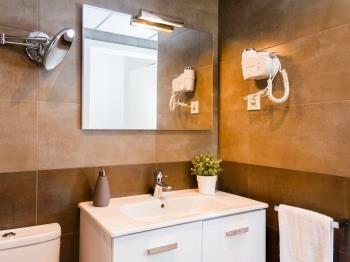 One set of linen and towels is provided at the beginning of the stay. We will offer you a basic welcome pack of basic products. You can acquire the rest that you may need in the shops available nearby. For long stays (more than 7 nights) an extra cleaning service will be done for free. This bright and cozy apartment (HUTB-010458) is located in a recently opened building 10 minutes walking from Plaça Espanya and the Fira de Barcelona. 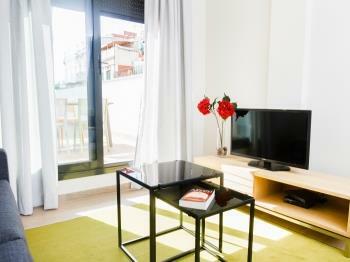 It is a very sunny apartment thanks to the large windows and the outside terrace. It has a master bedroom with a double bed, ensuite bathroom with shower and large closets and safe. The living room and kitchen are fully equipped with Satellite TV, DVD, free WIFI, ceramic hob, oven, microwave, washing machine ... decorated in an elegant style that will make you feel at home. The living room also has a sofa bed that can be converted into a double bed so that the apartment can accommodate a maximum of 4 people. 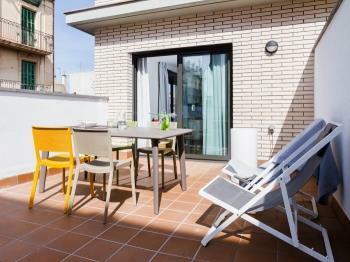 It also has a private terrace where you can enjoy both the sun and a good breakfast. The building has a communal terrace on the rooftop for our guests, equipped with chairs and sun loungers to enjoy the sunny weather of Barcelona and admire the views of the city and the mountain of Montjuïc. There is a lift, a reception desk and a car park (fees apply) in the building.